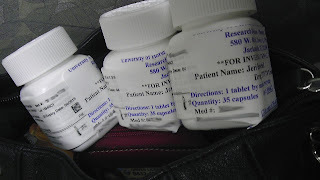 My part in the historic TRANSFORMS trial which helped bring the long-awaited, first ever, pill form of treatment for multiple sclerosis (MS) to market ended with my exit date of 1/20/2011. I remember being terrified to start that trial. It contrasted sharply to the day the extension ended and they had to physically toss me from their study center back into the cold, cruel, unsupervised world. They did so with a vague promise of a future "Extended Study" as soon as everything is lined up. I would be the canary in the coal mine, offering advance notice to those newly started on the drug in case something were to go terribly wrong over the long term. I kept my study coordinator's cell number on speed dial and would occasionally call to be the squeaky wheel in need of grease, pestering her about when that study might start. More than two years passed and I gave up hope. Friends in my MS circle who had also taken part in the early trials for Gilenya were sharing news of starting the long-term study. I was as disappointed as that one kid in grade school who comes in on Monday to hear all the happy chatter about the birthday party they missed over the weekend. Nobody invited me. Then one day I got an email from my old study coordinator asking if my mailing address had changed. She's the kind that likes to remember you with a card on your birthday or at Christmas so I figured it was something along those lines. Making one last feeble attempting at getting my squeaky wheel greased, I wrote back saying the address was the same and inquired if she heard anything about the long-term trial. Much to my surprise, the email I got in reply, which contained no exclamation points but was brief and to the point merely stated "I'm sending you the IC to look over for the long term trial." The "IC" being the Informed Consent. She probably sent me the email because she knew a phone call would result in maniacal screeching on the other end of the line. Although I read it cover to cover, there wasn't anything in there that could dissuade me from joining. I have been waiting 2 years, 4 months, and 3 days for this stack of papers to be in my grubby little hands, but who's counting? So, here we go again! I had my entrance tests all done on May 17, 2013 when I officially began this long term study. I went armed with my camera and made sure everyone knew "I'm blogging this", but I think most of them just thought I was weird. 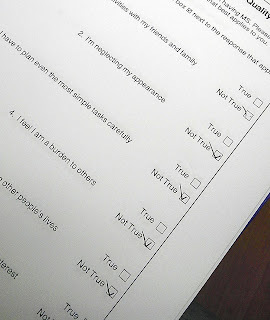 There is a Quality of Life questionnaire this time, same as before. 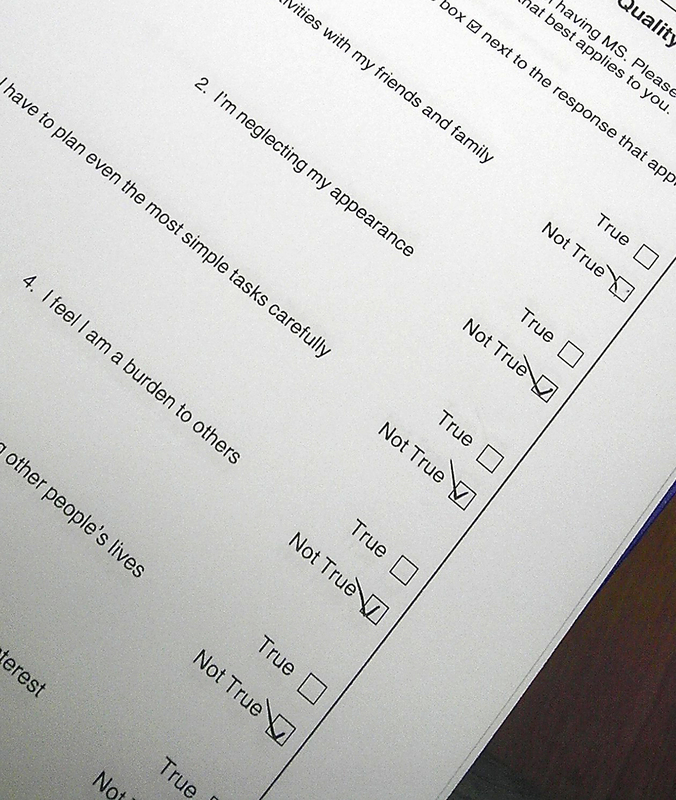 When I see these questions, like, "Do you feel you are a burden to others?" or, "Does you MS make you feel alone? ", I feel so sad for anyone that has to answer yes in order to be truthful. 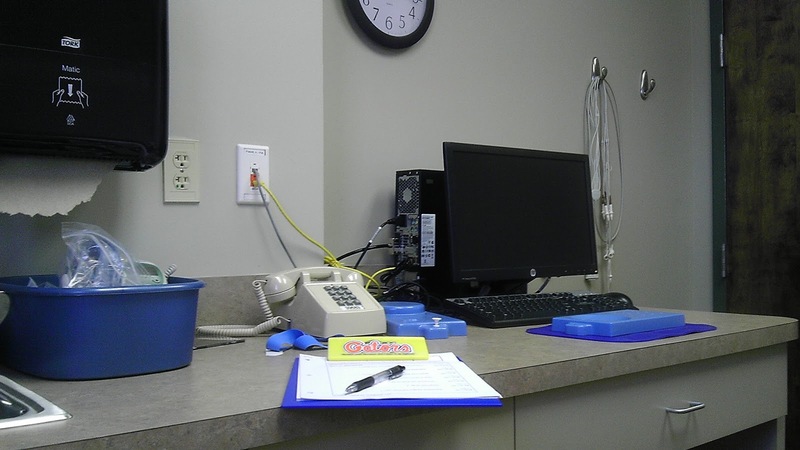 What our MS robs from us is often more invisible and less obvious. they look like on the outside–it's what's inside that counts! And these bottles are so much easier to manage for those of us suffering from the disease. Who has time for "slide this out, flip this down, try to push a pill through industrial-grade aluminum without crushing it, and then TRY to get the whole thing all flipped, folded and slid back to normal"? 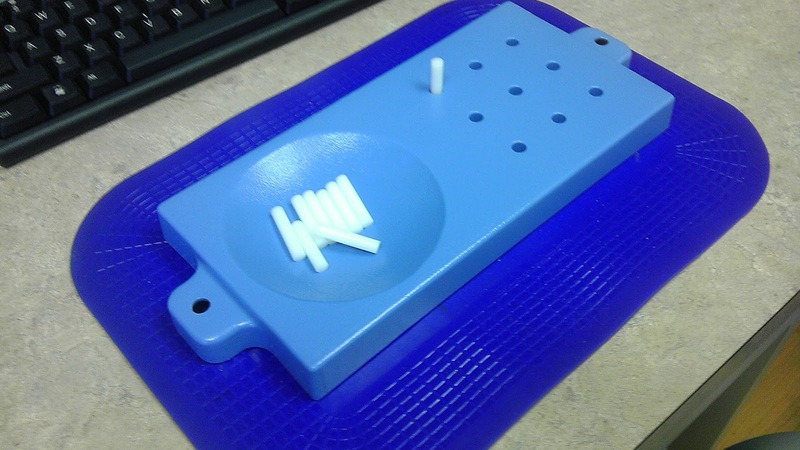 They have an all new, state of the art, peg test now! Nothing but the best this time around! See this post for the jack-o-lantern bowl we used last time and you will no longer wonder why I scored better this time. The story goes that the nurse who first used the pumpkin bowl to administer the test did so without authorization, however, for the sake of consistency throughout the remainder of the trial, we were forever punished with that slippery, contoured, deep sided pumpkin bowl. I do not miss it at all. And now everything seems to be a uniform (Gators?) shade of royal blue or light blue. 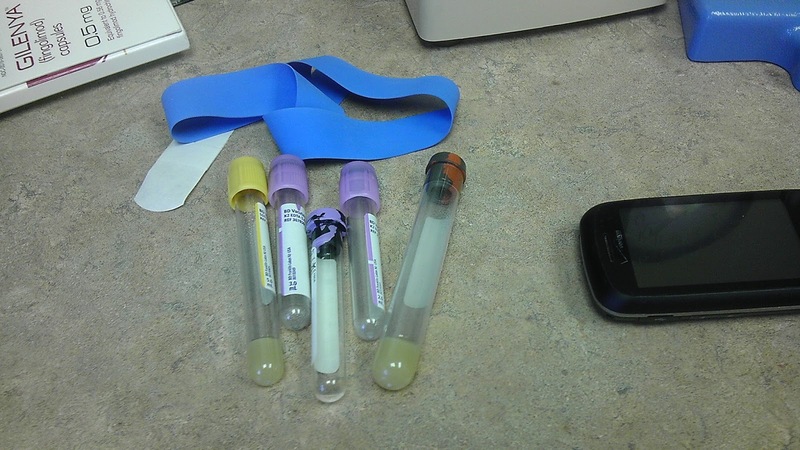 I had forgotten that half of my bodily fluids would have to stay behind, sucked out of me via a sharp, pokey needle, the likes of which I thought I'd never have to face again. I had forgotten the First Rule of Clinical Trial Visits: fluff up your veins by drinking lots of water to make blood drawing easier. The very last picture I got was of their brand new MRI machine. This replaced the old monstrosity they had, requiring the removal of an entire wall to get the swap made. 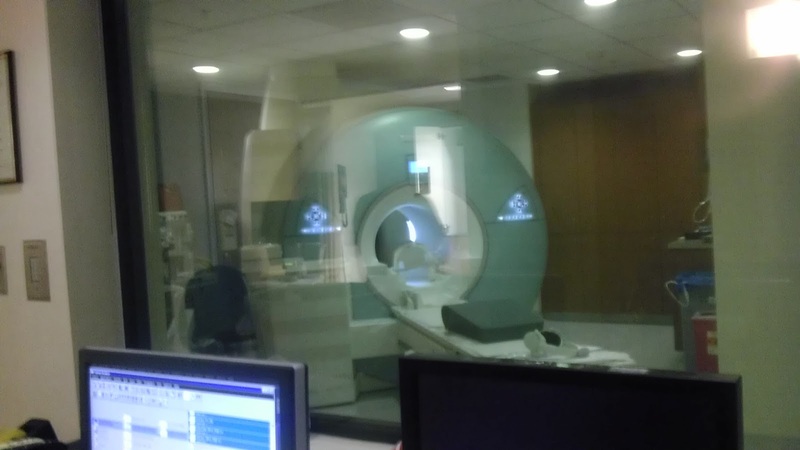 The surprise MRI was the only scary part for me this time around. You see, I had no idea it was even scheduled for the 17th, so I did not prepare by adequately fretting about this for a week prior and–more importantly–getting a Rx from my doctor for some Xanax. I'm still 50% hypochondriac, it turns out, and I am more than 20% Drama Queen. When the study coordinator emailed at 4:45pm on the 16th to ask if I planned to come up early so I could complete paperwork and other testing prior to my 11am MRI, I didn't even bother to hit "reply". I whipped out my cell phone and hit speed dial for her number instead. "What do you mean the MRI is tomorrow??" "I wondered why you never replied to my email asking if you were okay with that time." "So, is it the same machine as last time? Because that's a short machine and I could deal with the MRI in that thing. Then even if I had Xanax, which I don't think I do, it just ends up being recreational anyhow." "No, they replaced the MRI machine with a brand new one last year. It's much bigger." "Well, I don't know really. I know it's big." 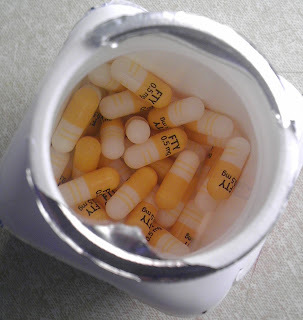 So I spent that night and the next day tearing the house apart looking for a bottle containing exactly half of one Xanax. The other half of the pill was the one I took at my last MRI upon exiting the TRANSFORMS trial on January 20, 2011. I finally found the pill the next morning, and even though I did take it, I think it just had a placebo effect. It was old and there was only half a pill. At any rate, I was able to lay in that tube long enough for them to get pictures of my brain without freaking out and squeezing the emergency bulb, shouting "GET ME OUT OF HERE!" Oh, you think that's funny? Heh. I've done it before. So this is the second time around and I'm older and wiser now. Well, older anyhow. This is Subject #0008 all over again, but I know the drill. You're looking at version 2.0. MS and Memory Loss: There's an App for That!